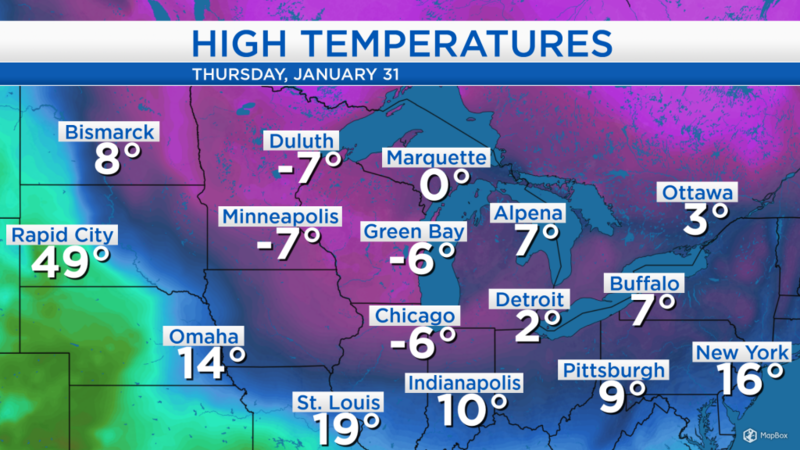 The arctic blast continues across the Midwest and Northeast states with several places reporting high temperatures below 0 degrees. In Alpena, temperatures reached a high of 7 degrees. Going forward, daily high temperatures will continue to warm through the upcoming weekend. Lake effect snow off of Lake Michigan has weakened, and we saw partly cloudy skies in Alpena for most of the afternoon. Dry weather will continue through tomorrow afternoon. After that, a brief disturbance could bring a few passing flurries tomorrow night. 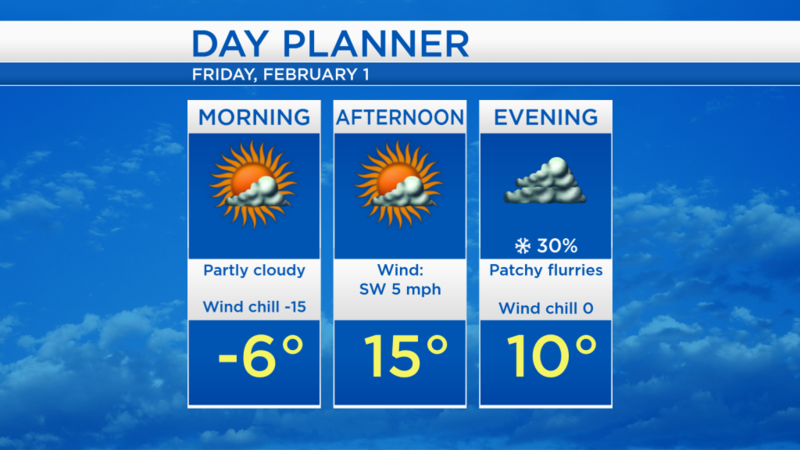 Overnight low temperatures will drop to -8 degrees and wind chill values will cool to around -20. Highs tomorrow afternoon will reach around 15 degrees with some sunshine throughout the day. A few flurries are possible tomorrow night, and temperatures will remain several degrees above zero. Looking ahead to the weekend, a storm system will strengthen over the Upper Plains. It will push warmer air into our area, but in the process it will likely create some messy weather. A chance of snow showers will begin late Saturday evening. 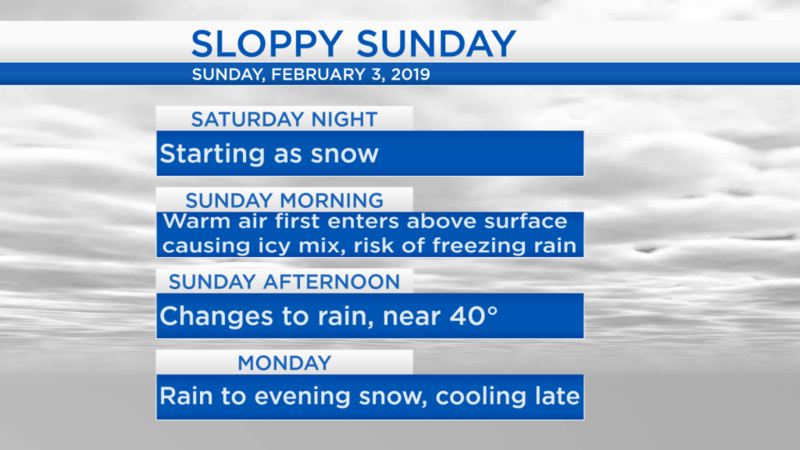 Temperatures will first warm above the surface and remain cooler at ground level — so a risk of freezing rain and ice will develop Sunday morning. As temperatures approach 40 degrees, the messy weather will change completely to rain during Sunday afternoon. Periods of rain are likely to continue into Monday afternoon (with limited dry periods). Late Monday, temperatures will cool as the storm system leaves our area causing a possible changeover to snow. In the meantime, enjoy tomorrow’s sunshine with temperatures several degrees milder than the past few days. Temperatures will climb to around 30 degrees on Saturday, and most of the day is looking dry. The messy weather will likely begin Saturday night, changing to rain by Sunday afternoon. Warm temperatures will likely last for both Sunday and Monday, then temperatures will cool, settling at near-normal values midweek. For the rest of Northeast Michigan’s weather forecast, watch the latest weather video by clicking the weather tab at the top of the page.